Aside from making the outside of your home look less attractive than one might like, a busted garage door could cause a variety of problems. If a storm or accident has irreparably damaged your door, it may not open and shut correctly, if at all. Nobody wants to be trapped in the garage with an important appointment to get to, or outside of it after a tiring day at work. More so, if your door is mangled enough, it may get stuck open, which can again lead to those unwanted visitors in your garage itself. 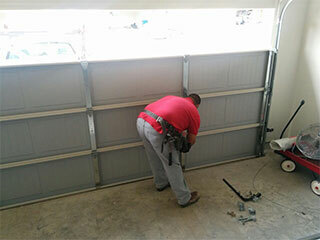 Let us help install your new garage door! Rather than allow those troubles to persist, let our experienced team install a new garage door instead! We have all kinds of styles from the standard, to varying carriage types, and more. Not only will it keep your home safer and make the constant come and go faster, but it'll get your house looking as fresh as the day it was built again! Impress the neighbors and save yourself a headache all in one fell swoop. You may not have considered it before, but your garage door opener is important when it comes to the safety of your home. While a malfunctioning opener can certainly be aggravating if it slows your coming and going from your home, more than that it can put anything stored in your garage at risk. If you believe you've closed your door, but the opener didn't work and instead left it open, anyone could easily come in and take lawn care tools, bicycles, or whatever else is kept there. Even more worrisome, it could give cover to someone trying to break into your home itself that they wouldn't have on your front doorstep. Don't let your garage door opener create a risk for your home's safety, instead allow us to install a new one that you can rely upon without worry. Whatever type you prefer, such as LiftMaster or Genie, we likely have it ready to go. There's No Reason to Wait! Be it a new opener or door, or both, call us now and find out how our trusted team can get to work on installation. We're here in Highland Park, and ready to accommodate you!